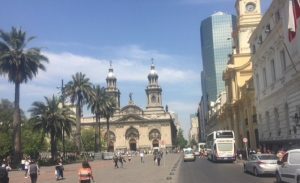 While most of the GLCM team had left for the states, five of us were able to explore a few well-known places in Santiago and learn more about the Chilean culture. 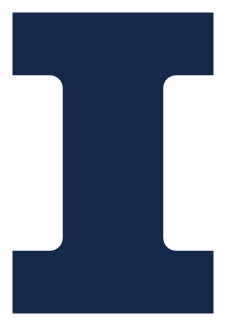 One of the most noticeable differences was the orientation of shops and vendors. They were located on the streets and sidewalks in tight spaces in many neighborhoods (also the case in Buenos Aires). 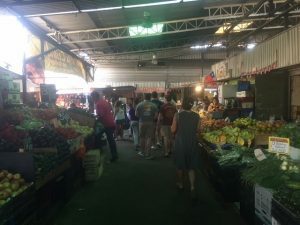 The first stop we made was to a farmer’s market called “La Vega” which stands for the meadows that once existed upon the land it now flourishes. Different from traditional farmer’s markets, there was an inside and an outside that existed for different purposes. The outside was an area of wholesale, a place for individuals to buy substantial quantities of fruits and vegetables. The inside was a more traditional farmer’s market that allowed people to buy weekly groceries and find convenient snack shops. There are four main regions that represent the inside part of the market: fruits/veggies, spices, meats, and dried fruits/beans/miscellaneous cooking items. As we wandered around the market, it was clear to see that it was a chaotic environment, one in which other individuals often bump into you. 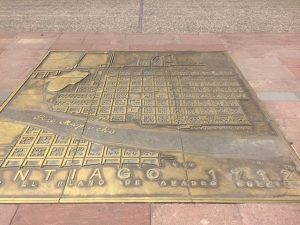 The marketplace owners are neglecting modern change and maintaining the market’s 100+ year history; the area near the Mapocho River (including the marketplace), referred to as La Chimba, once stood as a meeting place for the people of Santiago. The marketplace is located on the southern part of the Mapocho River as seen in the picture below. After visiting the marketplace, we traveled to the Plaza de Armas, the original city center of Santiago (designated by the non-textured square in the center of the map). Upon the Spainards arrival in Chile, they found the Inca city center and decided to take it for their own (circa 1541). The original buildings have been destroyed by earthquakes and fires (due to their wooden structures). The buildings that now surround the city center were constructed in the 19th and 20th centuries. The post office headquarters, a museum, and a cathedral are just a few of the buildings in the city center. Although most of the city buildings have moved away from this site, it remains a historical part of Santiago. Before we left for the constitutional plaza, we were able to pass by the Museo Chileno de Arte Precolombino, the Chilean Court of Justice building, and the financial district. The Larrain family (Familia Larrain) has preserved and maintained many artifacts from pre-Colombian times. The construction of the Chilean Court of Justice Building is especially interesting because it was completed in two phases due to the lack of funding necessary to complete the project. The left side of the building was completed roughly 15 years after the right side, yet they are almost identical. On our way around town, we ran into the mayor of Santiago, Felipe Alessandri Vergara. 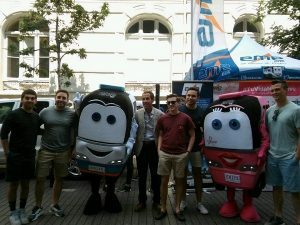 He was promoting a breast cancer campaign, one of the many campaigns that are present in Chile. 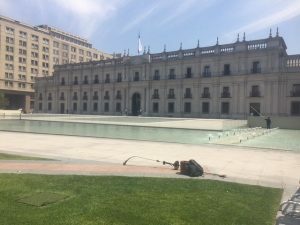 We were also able to visit La Moneda Palace which is the workplace of the president of Santiago and many other government officials. Built in 1805 with French architecture, this building was originally used to print money. Once home to the president, it now only exists as the workplace. 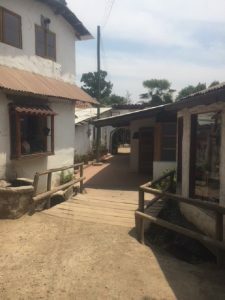 The last part of Friday’s tour included a visit to Pueblo Los Dominicos. This secluded marketplace area resembled small countryside shops with clay roofs. 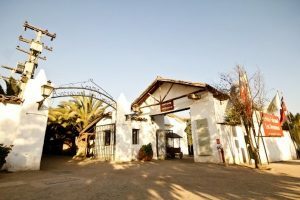 Although a tourist destination, the relaxing feel and cultural gifts made it a spot for many locals. Before heading to the airport, we made a last-minute stop to visit the top of San Cristobal Hill. We were able to see an incredible view of Santiago. 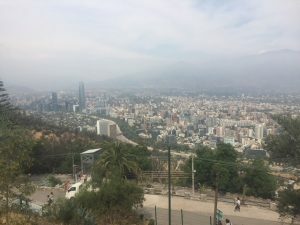 This stunning glimpse of Santiago really made us thankful for the educational and cultural experience we were able to be a part of. We are thankful for everyone that helped us along our journey in South America. Successfully returning to the United States, the GLCM team is ready to put our newfound knowledge to use.